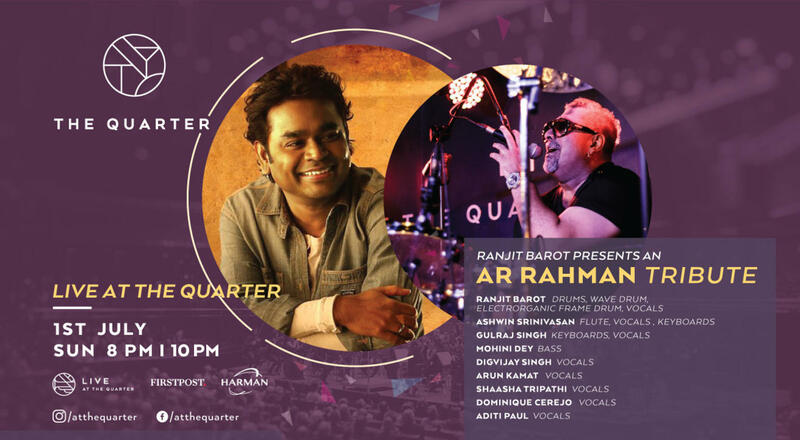 In our continuing series of exclusively designed concerts by our Musical Curator, Ranjit Barot, The Quarter is proud to present an evening dedicated to the iconic and globally influential Indian Composer, A.R.Rahman. With his long musical association with the maestro, and his personal experience as Musical Director for A.R.Rahman Live, Ranjit brings together a specially gathered ensemble of talented musicians and singers for this rare and intimate presentation. This evening will take audiences through Ranjit's unique interpretations of A.R.Rahman's extensive and path-breaking repertoire, weaving through his inimitable compositions in mainstream films, independent albums and his momentous contributions to the Sufi tradition. For a seamless experience please be at the venue at 7:30 pm. The seats are first come first serve basis. The show will commence at 8 pm. The runtime of the show will be 80 minutes.